MyHealthDirect is the leader in consumer healthcare access solutions. MyHealthDirect makes it easier for consumers to interact with the healthcare system. Internally, they have a team of sales veterans, experienced in taking opportunities to close. However, their sellers were running low on new, qualified opportunities. As a result their customer base was satisfied, but not growing fast enough. MyHealthDirect turned to Funnel Clarity to refine their team’s ability to generate new business, and saw a 5x increase in meetings with targeted C-Level leaders. In late 2015, as Senior Vice President of Sales and Marketing at MyHealthDirect, Chris Lukasiak identified a primary focus: get more qualified meetings with buyers. For MyHealthDirect, buyers are C-Level leaders. They needed a minimum number of meetings with these leaders every quarter in order to hit quota. The sales team at MyHealthDirect is supported by targeted email automation tools that were successful in keeping them top of mind for C-Level leaders and in some cases, even scheduling meetings. However, there was little prospecting by phone; the seasoned sales team had come to expect gatekeepers and assistants to be the only outcome of calling on prospects. As a result, many sellers were still running low on meetings with qualified leaders. So, in mid-2016, MyHealthDirect turned to Funnel Clarity to help their team get in front of as many C-Level leaders as possible. In addition, Chris wanted to help his team navigate the rollercoaster of sales by prospecting for a more consistent flow of meetings. This involved onboarding younger, less experienced team members and equipping them to secure meetings with C-Suite leaders as fast as possible. We are only 45 days’ post training, and I can already tell you it has changed the trajectory of our business. For these reasons, MyHealthDirect was immediately drawn to the flexibility and consistency of Funnel Clarity’s Persuasive Prospecting© online training course. The course is a virtual sales training platform that runs for three-weeks, averaging 30-60 minutes of learning each day, followed by an additional four-week reinforcement period. And while the learning format may have been an initial attraction, the impact has surpassed even their highest expectations. 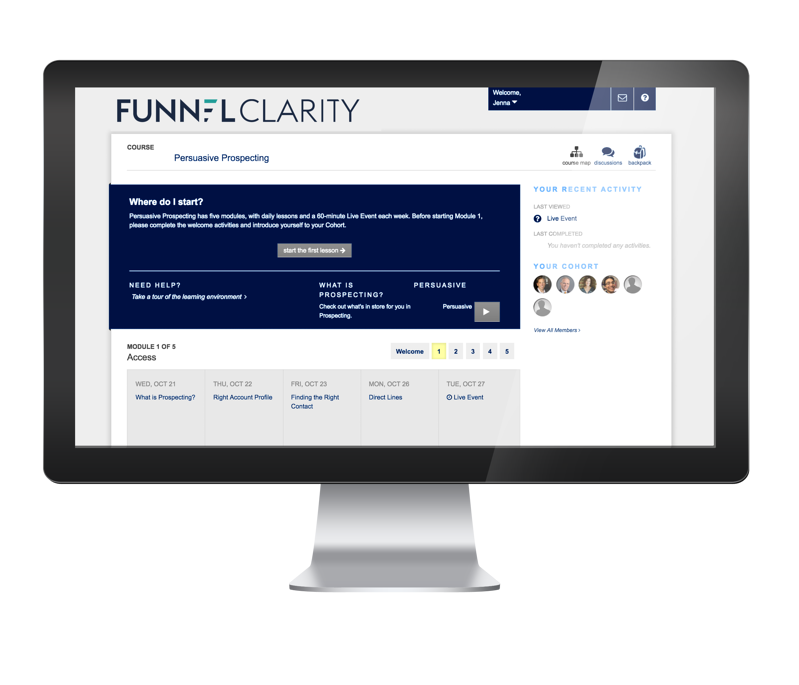 In late 2016, several teams from MyHealthDirect enrolled in our virtual learning platform to learn Funnel Clarity’s Persuasive Prospecting© content, and began to see an immediate impact. During the first two weeks, MyHealthDirect doubled the number of meetings with C-Suite leaders at targeted accounts. The flexible timing of virtual learning allowed the team to apply new approaches and get results right away, while continuing to learn and develop mastery. “I thought spacing out the training each day over 3-4 weeks was an excellent way to help my team retain the knowledge gained. I have truly been blown away by our results,” said Lukasiak. MyHealthDirect went on to achieve a 5x increase in meetings with targeted C-Suite leaders within 45 days of the last training session. “To say it has been impactful would be an understatement,” according to Chris. Today, MyHealthDirect continues to see improvements in meetings with decision makers at targeted accounts. “I could share dozens of stories, just in the last month alone, how my salespeople have obtained in-person meetings with CEOs at the top of organizations that 99.999% of salespeople never speak to,” Chris shared. In addition, the sales team has embraced gatekeepers and assistants as a valuable route to C-Level execs. The buyer-focused approaches in Persuasive Prospecting© allow MyHealthDirect to provide value earlier in the sales cycle. “The seriousness with which these leaders take our meetings has been impressive due to the set-up strategies and tactics my people are using from the training,” added Lukasiak. These factors combine to dramatically increase the sales team’s efficiency, allowing them to make fewer attempts and spend more time with qualified contacts. MyHealthDirect now generates 12% more meetings with C-Level executives per outbound prospecting call. Interested in achieving similar results? Please fill out the form below and we'll be in touch to discuss your sales funnel.